Having started with one small steakhouse, Golden Corral Corporation has grown into one of the nation's strongest family restaurant chains. The ability to adapt to changing tastes allowed Golden Corral to continue growing during the 1980s and 1990s as changes in eating habits and increased competition brought drastic change to the family steakhouse business. Success continued in the 2000s as well--by 2003 the company operated and franchised 467 restaurants throughout the United States, serving 167.5 million guests that year. Preheat your oven to 350 degrees. Rinse your beef and pat it dry with a clean paper towel. Place the roast in your roasting pan fat side up. Press the cracked pepper into the surface of the roast, as well as 2 tablespoons of the thyme. Roast the meat for 2 hours or a little over. The goal is to reach an internal temperature of 135 degrees. You'll need a probe thermometer to determine internal temperature, inserted about 2 inches into the thickest part of the roast. Once the roast is finished, take it out of the oven and cover it with aluminum foil. Let the roast rest for at least 15 minutes before you try to slice it. When the roast is first taken out of the oven all of the juices have expanded. If you cut into it all the juices will come running out and you'll be left with a dry roast. By letting the meat rest the juices will be able to redistribute throughout the roast leaving you with a moist, delicious meal. Horseradish Sauce: Mix the sour cream, horseradish and sugar in a glass bowl until combined. Put this in the refrigerator while the roast cooks to let the flavors marry. Gravy: Melt butter in a large cast iron skillet on about medium heat. Throw in the onions and cook them for about 10 minutes, stirring regularly with a wooden spoon, until they are starting to brown. Toss in the mushrooms and continue to cook for about another minutes until the mushrooms are soft and tender. Sprinkle in the flour stirring constantly, and cook until the flour begins to brown (about 1 to 2 minutes). This will add a nutty, toasty flavor to the gravy, while making sure that the flour can absorb all of the broth without clumping, leaving a nice, smooth gravy. Stir in the broth and simmer for another 5 minutes, stirring constantly, so that the gravy can come together. Take the gravy off the heat, stir in the mustard, and you're ready to serve. Slice the meat between 1/4 and 1/2 inch thick, depending on your crowd. Ladle on some gravy and top with a nice dollop of horseradish sauce. Premium Weekends: The regular buffet, plus carved prime rib, batter fried shrimp and honey teriyaki glazed salmon, around $13.99 (a $2 premium to the regular buffet). Ryan’s, HomeTown Buffet, Old Country Buffet and Country Buffet are offering two different shrimp and fish dishes for families during the Lenten period. 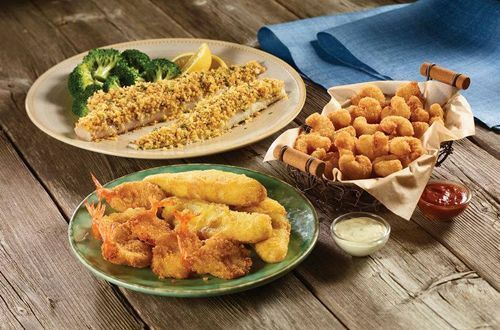 The family casual restaurants will offer Popcorn Shrimp and Crispy Battered Fish filets daily as well as special Butterfly Shrimp and Salmon items during dinner hours on Wednesdays and Fridays until April 24, 2016 at participating locations. There are also a variety of non-seafood dishes that families may enjoy including customizable home-style salads and the fresh salad bar. Baked and fried chicken, pasta dishes, home-style soups and various other non-seafood dishes are offered daily. Guests can indulge with a delicious sweet from the dessert bar. The “Breakfast for Lunch and Dinner” promotion will be available through the summer 2015. The offer makes Golden Corral’s weekend brunch menu available all day throughout the week. The menu, which includes items like pancakes, sausage, bacon, waffles and omelets, is in addition to Golden Corral’s 150 item buffet menu. Most consumers say they want breakfast offered all day. According to the National Restaurant Association, seven in 10 consumers want restaurants to serve breakfast items throughout the day. Younger consumers were more likely to say so. A decadent meat carving station isn't reserved for just hotel restaurants and cruise ships anymore. Thanks to family style restaurants, Old Country Buffet, HomeTown Buffet and Country Buffet, diners may now indulge in premium carved meats any day of the week, and all at a great price. Offered daily during dinner at participating buffet restaurants, the new Carvery serves a rotation of four different premium, mouth-watering meat options. Menus, hours and prices vary by location. Call your local store for details and schedule. Expect an assortment of premium meats at the Carvery Station like juicy roast beef, ham, smoked sausage, oven roasted turkey, baby back ribs, Atlantic salmon, fried pork chops and grilled chopped beef steak. These meats pair perfectly with the restaurants’ home style sides, including a fresh salad bar and dessert selections. Ryan’s, HomeTown Buffet, and Old Country Buffet are honoring Lent by offering their best catches of the season with a special Seafood Fridays menu. The family casual restaurants will offer various fish and shrimp options every Friday night, in addition to their standard menu. These seafood offerings may be paired with any number of homestyle sides and the fresh salad bar. As always, every meal may be completed with a delicious treat from the dessert bar. The Seafood Fridays menu will be available during dinner hours starting February 20 and through April 3, 2015. Menus and pricing vary by location. The Ovations Brands portfolio of restaurants- Ryan’s, HomeTown Buffet, Old Country Buffet, Country Buffet, and Fire Mountain- are grilling up a new line of signature steak choices that are made fresh and served in individual portions. The Steaktastic menu will be available at all 321 family style restaurants for a limited time starting Thursday, November 20, 2014. The Steaktastic line up is completed with Country Fried Steak and 1/3 lb. Chopped Beef Steak. To compliment the steak offerings, the fresh salad bar will feature a blue cheese and bacon salad- crisp lettuce topped with a blue cheese dressing and bacon bits. On a sweeter note, all 321 restaurants will be serving new individually portioned desserts, chocolate brownie cheesecake and blueberry cheesecake shooters. The brownie cheesecake shooter features gooey brownie bites, creamy cheesecake and a whipped topping. The blueberry cheesecake shooter features a graham cracker base topped with a creamy cheesecake, blueberry compote and whipped cream. Both will be available in the bakery section. Copycat Recipes for items on the menu at Golden Corral Restaurants.